The marketplace for smart thermostats has exploded in recent years, leaving homeowners with lots of choices – and sometimes lots of confusion. If you’re comparing some of the top choices – Côr™, Nest, Honeywell Lyric, etc., the experts at Carrier and Stay Comfy want you to know why Côr™ Thermostats stand out above the rest. Not all smart thermostats are created equal. Whether it’s design or function, each system has features that make it unique. Like programmable thermostats, smart thermostats let you set up a schedule to turn the temperature up or down depending on if you are at work, sleeping, or returning home. But smart thermostats go a step further for greater flexibility. For example, if you’re staying an extra night at the cabin, arriving home early from work, or staying out a little later for a happy hour, you can manage your thermostat from your phone or computer – saving your home energy whenever your schedule changes. Other advantages of smart thermostats include their ability to learn from your behaviors and schedule. Some, like Côr™, can even adjust to outside weather conditions in order to make sure you have the greatest indoor comfort. Others, including Côr™, have sensors that can tell if you’re at home or away and adjust accordingly. When you’re comparing smart thermostats, be sure you look for these features that should be included with any top choice. Intuitive Wi-Fi Capability. Not all smart thermostats have an intuitive app or interface to control them. In fact, some are downright confusing. Since apps and smart thermostats are so closely connected, it’s a good idea to download apps for any thermostats you’re considering and check them out before you buy. You can also ask for a demo from local dealers. Programmability. You should have full ability to program temperatures for various times of the day, with the ability to override a program remotely when needed. The most sophisticated thermostats will even learn your usage patterns and adapt to them automatically. Alerts. You’ll want the ability to define temperature thresholds – highs or low – and receive notifications if they’re exceeded. It’s just like setting a balance alert for your bank account. Energy Monitoring. This feature lets the thermostat record and report on your energy usage, so you can monitor the efficiency of your system. Humidistat. Depending on the model and your HVAC system, some smart thermostats also control humidity in your home and can automatically adjust that humidity to changing conditions. It’s a feature some homeowners can’t do without. Since the app is so quick and so easy to use, you will rarely need to access the thermostat directly. If you’re puttering in the basement or already snug under the covers, you don’t have to move to adjust your comfort. “Why walk to the thermostat to make an adjustment or view comfort conditions when you have instant access on your smartphone or tablet?” Keith asks. Next, Côr™ Thermostats feature monthly and real-time energy reports that can help a homeowner save more money. If you’re cost conscious and want to keep your energy bills low, you’ll be able to see month-to-month comparisons that show fuel usage compared to a conventional thermostat. If you notice a big jump in your bill, the reports alert you to the biggest contributing factor. 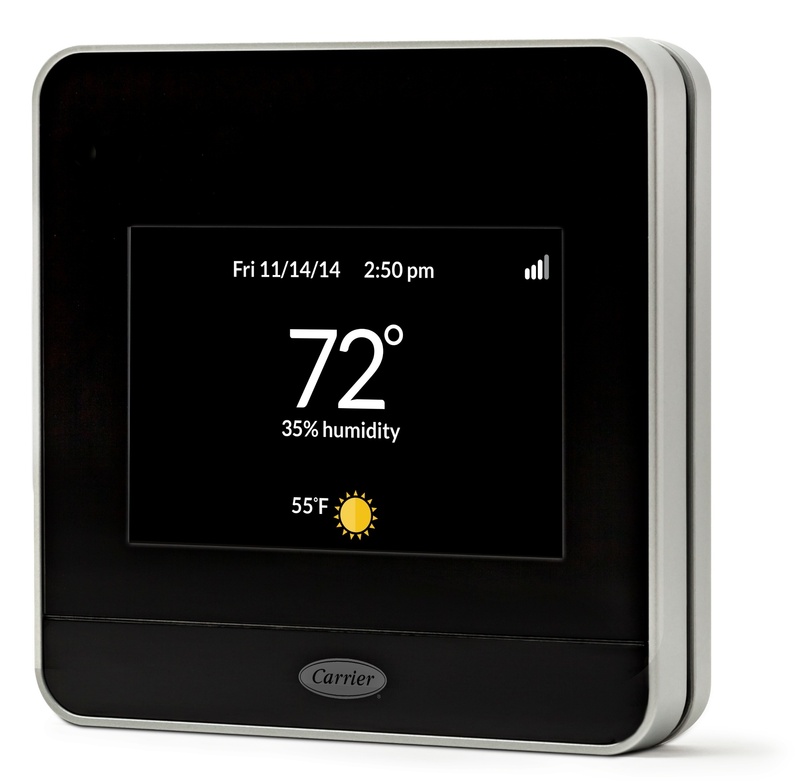 Carrier offers several Côr™ Thermostat options to fit any homeowner’s budget and needs. You can check out and compare the latest models here. Or, just ask us how the Côr™ can help you save! If you’re interested in learning more about getting one installed, talk to our experts at Stay Comfy to learn more.